Let me tell you how much I love cereal. It’s my breakfast of choice. This past September, we traveled to Bar Harbor, Maine, where we stayed in a “just the necessities” kind of motel. Our philosophy is why pay a lot for a room you’re just going to sleep in? The cheap and dated, but tidy motel didn’t have in-room mini fridges. This meant, we had to wing breakfast (a lot of times, we’ll buy cereal and milk at our destination if continental breakfast isn’t offered). So, after three mornings of trail mix, granola bars and apples for breakfast, I was dying for a bowl of the good stuff. In fact, I told my husband that I would much rather have a bowl of cereal each morning than drive a cool car (like the Fiat we were rented) for the rest of my life. My go-to cereal? 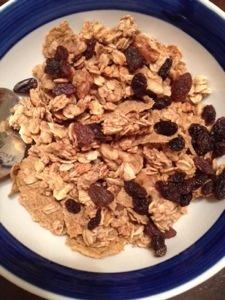 Store-brand bran flakes with a handful of walnuts and a couple spoonfuls of raisins. It’s taken me 30 years to realize the only way to get the right ratio of cereal inclusions is to do it yourself. 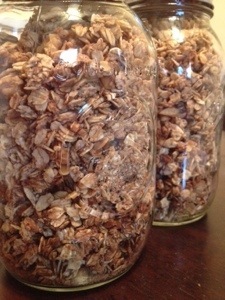 Just recently, I stumbled upon this recipe for Banana Walnut Granola. Having a couple of bananas heading south on my countertop, I gave it a go. It’s good. It’s really good. I will tell you I omitted the cashews (totally unnecessary, but I’m sure a nice bonus) and I baked it all on 2 cookie sheets. Delicious on its own, this granola has revolutionized my breakfast. Behold the tastiest bowl of cereal! Pour a base layer of store-brand bran flakes. Then add granola. Top with a couple spoonfuls of raisins. Finally, soak it with 2% milk or plain almond milk. Pure morning heaven.